I have been craving carrots this pregnancy. Interesting, huh? But instead of my usual carrot sticks with lunch, I decided to try something new. 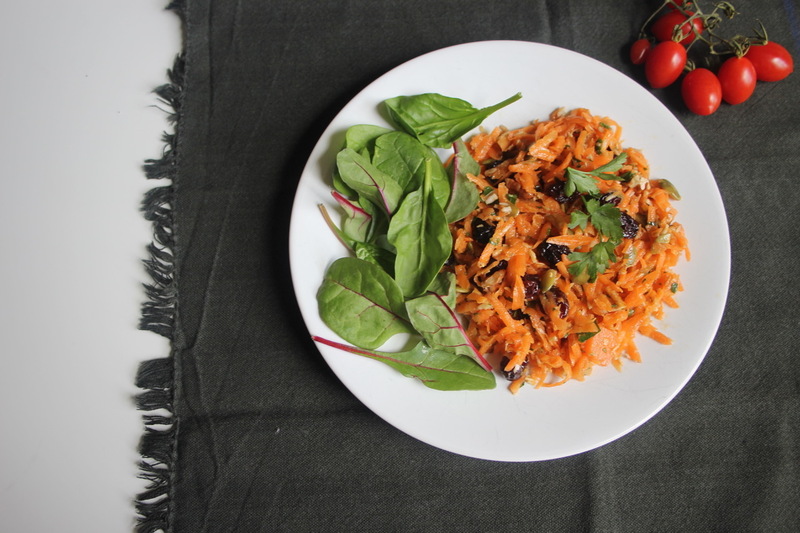 And this salad is ready in just a few minutes and is undoubtedly the Best Carrot Salad EVER! Packed with tonnes of healthy items, it is simply delicious and nutritious. Also great as a side dish, we had ours with roast duck and steamed potatoes, I am sure this would be a winner at any Easter meal too. My children loved it, as the sweetness comes thru with the fruit and the shredded coconut, but it isn’t sickly sweet with the balance of nuts, and the dressing ingredients too. This recipe takes a few minutes to prepare, but I like to make it in advance so all the flavours meld together for a few hours. And it lasts in the fridge for 24 hours… if you don’t devour all of it first. In a small glass mason or jam jar combine the avocado oil, apple cider vinegar, honey, ginger root, mustard, salt and pepper and whisk vigorously with a fork or shake it until it is well mixed. Pour it over the salad and stir. Serve with extra pumpkin seeds and some sprigs of parsley. Now that I have made a healthy carrot recipe, perhaps I can treat myself and try Courtney’s favourite Carrot Cake this Easter too?